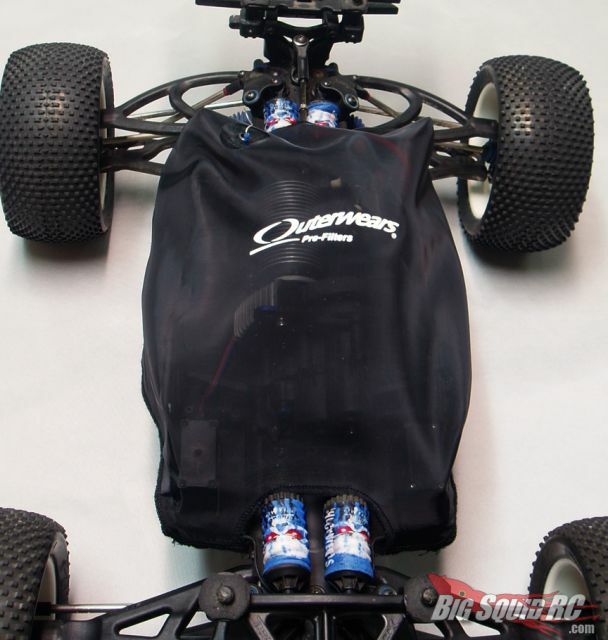 Outerwears covering up E-Revos « Big Squid RC – RC Car and Truck News, Reviews, Videos, and More! Outerwears, makers of fine outer wear, have a new way for you E-Revo owners to keep your truck clean. Their water repellent shroud helps keep water, mud, dirt and all that other junk out of your chassis, while still allowing necessary airflow to keep the electronics cool. The shroud comes with Velcro to keep it attached securely to the chassis. It is compatible with both the brushed and brushless editions of the E-Revo and comes in a veritable rainbow of colors: black, blue, red, yellow, orange, purple, and lime green. This shroud is available now direct from the Outerwears web site or through your local hobby shop. MSRP is $39.99.